It’s freezing cold outside and spring is nowhere to be seen. When the weather is like this, it’s time for stews of slowly braised meats in yummy sauces and mashed potatoes. It’s time for comfort foods and sweaters and hot cocoas. It’s time for coq au vin! 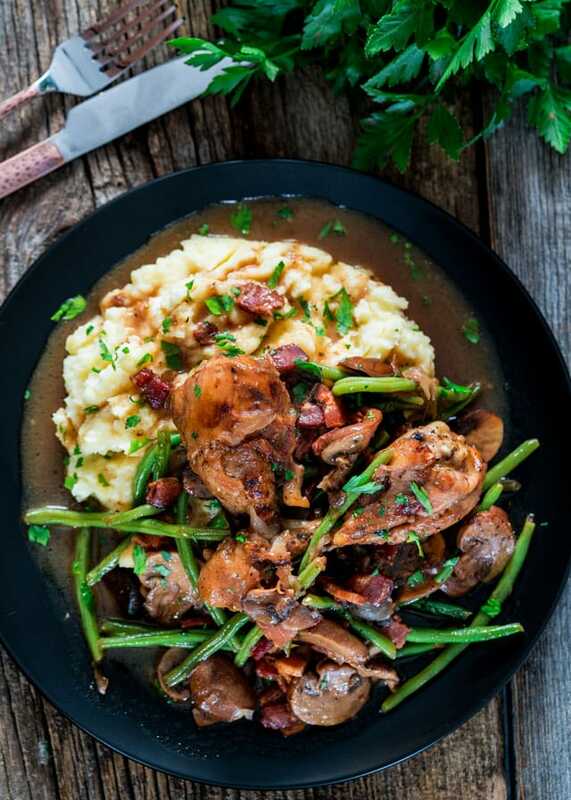 Coq au vin simply means chicken in wine, and no I didn’t take out that French dictionary or bring up google translator to figure that out, but those French classes in grade school and high school are finally paying off. Plus, it’s a dish I’ve been making for years and it’s really one of our favorites. It’s my kind of soul food. Eat a plate of this with some hot mashed potatoes and you’ll be happy, your belly will be happy, it’s all good! 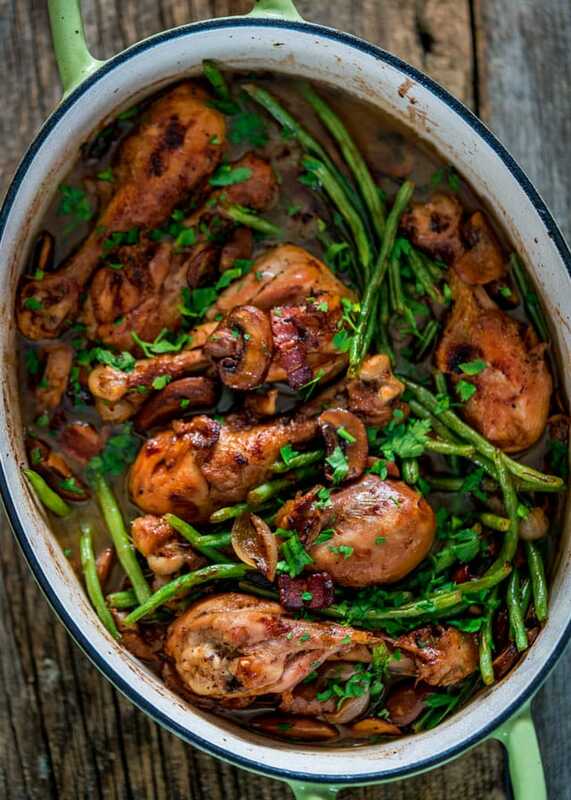 Coq au vin is really the classic one pot dish, however it’s also a labor of love. Braise the chicken in red wine and chicken broth, until it falls off the bone. Use chicken with bone in and skin on for that extra flavor. Trust me this dish has many layers of deep rich flavor. Make sure you savor this slowly. Put some French music on and open a bottle of red wine as you’re eating. Go for the full experience, my friends. 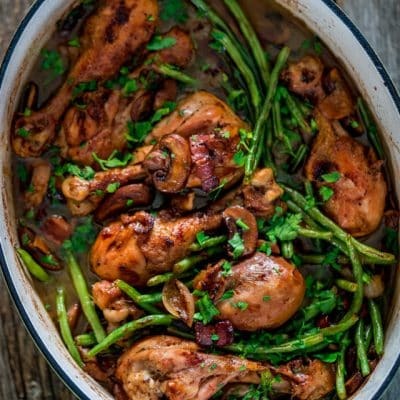 In classic coq au vin there are no green beans, which is why I’m not claiming this is a classic recipe. However, I wanted some more veggies, so I threw in some haricots verts which were perfect! See, I know my French! This truly is my kind of weekend cooking, though I totally make this during the week as well and serve it with creamy mashed potatoes. Best part is you have leftovers for the rest of the week which makes for some awesome lunches. Did I mention there’s bacon in this? Oh yeah, there’s bacon! 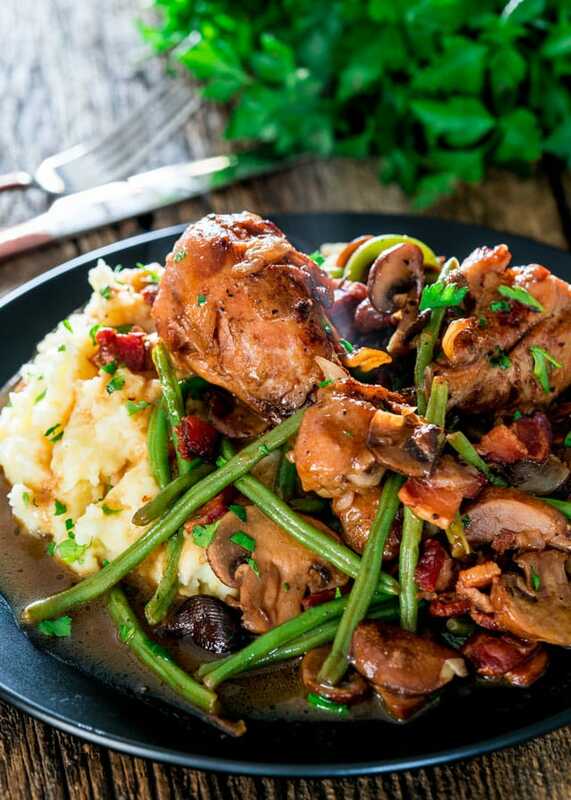 Traditionally Coq Au Vin is made with a Burgundy wine, a Pinot Noir or a Shiraz. While the purists will swear by Burgundy wine, I’m here to tell you that the red wine doesn’t matter quite as much. However, my advice to which wine to cook with is always to cook with the wine you drink, not the cheap cooking wine. So if you buy yourself a good bottle of Pinot Noir, then by all means use Pinot Noir in this recipe. I am also a die-heart fan for chicken.I like this recipie alot.Thanks for giving information about this delicious recipie. This looks amazing! I was wondering if there was anyway to reduce the amount of butter. Could I use olive oil instead, or a combination of both? I would do half and half for olive oil and the butter! can you do this in an Instant Pot? it sounds delicious! Hi, you need to add Dejon mustard… a heaping tablespoon or so to the mix. Also, go with about two dozen pearl onions instead of the sliced onion… more visually pleasing than otherwise. I use a couple of chickens, pieced out instead of just chicken drumsticks!! I love Coq au Vin! what would you use for flavor besides the wine, if you couldn’t use wine? I’d go with chicken stock. Wow! Love this recipe so much. I wanted to lick the plate. I do think that once the beans are added you could skip the oven and just simmer for 10-15 minutes uncovered, stirring frequently until the beans are done. I will definitely be making this many more times. Those drumsticks are such an eye catcher! I have never been much into French cooking, but this dish is really a favorite of ours. I have never used green beans, but they look just wonderful there, I will keep that in mind for next time. Scrumptious! I could devour a bowl right now and it’s 94°F outside! 94°F eh? No such luck here, though it is a beautiful sunny day here in Calgary! Absolutely wonderful! I made it and increased the sauce considerably. Everyone and I mean everyone loved it. Even dear old dad who only likes a hamburger with ketchup, lettuce and tomato. The green beans were a very nice addition. Oh that’s great, glad you all enjoyed it! I made this last evening for dinner! Fantastic!! Love your blog all the way down in south Texas! Oh silly me, added it to step 6. Hope you try it, it’s really good and perfect for this time of year! That pan sauce looks so flavorful and delicious. Lovely photos as usual!